There’s More Than Bugs Bugging Me! As it happens, bugs aren’t the only things bugging me lately. Over the weekend, my internet went out. This occurs more frequently than I’d like, mostly because we’re on the end of the line. That’s one of the drawbacks to living in the country I’m afraid. We’re on the end of our electric line, telephone line, tv cable and internet lines. Our electricity can go out and we can look at those dratted new subdivisions around us, and their lights will still be on. And if there’s an ice storm, forget electricity for a few days! The lines will be fixed everywhere else before they get to us. Fortunately, that’s a fairly rare occurrence around here. Anyway, I spent over an hour trying to get hold of our internet company on Saturday. First they want you to go through an automated system. Plleaassee people, by now I know that if my internet went out, try resetting the modem by unplugging it from the power for a while! And I REALLY get irritated when they get to the part about going to check and see if the tv’s are getting reception. That rarely makes any difference. If someone runs into a pole and knocks *everything* out, okay. Otherwise, the tv will be working fine, but we’ll have no internet. Even more frustrating is to get totally through the stupid automated system, get to a real, live person, and after they ask you for your phone number and get it. . . the line goes dead. ARRRGGGHHHHHH!!!!! When I tried calling back I was informed there was “unusually high call volume” in our area, and there must be a problem, and if we still didn’t have internet in 4 hours, call again. Well, guess what? Four hours came and went and still no internet. So I called again, and when I got a real, live person, I said, ‘DO NOT HANG UP ON ME AFTER I GIVE YOU MY PHONE NUMBER!!! !” He was a bit taken aback, and told me if we were cut off, he’d call me back. Yeah, that’s what I thought the LAST dude should have done, but he didn’t. At any rate, he flipped a few switches from his end, told me unplug everything again, including all the routers, and we finally got the internet working. To my desktop computer, that is, and my desktop only. Whatever went wrong zapped the router. I worked on it. The Geek worked on it. I tried using the set-up disk that came with it to reset everything. Nothing worked. Great. So now I needed a new router. Without one, the Cave Geek had no internet to his computer in the basement, and I couldn’t use my laptop either. Bummer. Well, fine then. Sunday we went out and picked up a new router. The Geek hooked it up, I ran the set-up disk, and BOOM! We’ve got internet to all the computers again. That made me happy, but the fates weren’t through with me yet. Up pops an even worse pain in the posterior! I got an email with an alert from one of my credit cards, telling me I’d spent about $300 on TracPhone that day. Say what??? Yesterday I spent over an hour talking to TracPhone to get the charge taken off my credit card. It took a long time, but they did finally agree to remove it. If that had been the end of it, I might have figured it just was a mix-up with them, because we DO use TracPhone. That I should be so lucky. Nope, there came a second email with an alert for a charge of almost $200 to LetsTalk.com, which I had never heard of. To make a long story short, somewhere along the line, someone got hold of my credit card information. When I saw the second charge, I was on the phone to the credit card company canceling that card. Which, by the way, took another hour or so, as I had to go through telling her what charges I was disputing and why I wanted that card canceled, and in the time I was talking to her, yet another alert came through saying I’d charged almost $850 to Dell Computers. Oh wow, now I’m REALLY MAD!!! I’ve been putting off buying a new laptop computer to replace my dinosaur, waiting until I’m making money and can justify it. And then someone else steals my credit card info and BUYS A COMPUTER!!! NOOOOOOOOOOO!!!!! That is soooooo wrong in sooooooo many ways! One of the many things that really bugs me about all this is the fact I’m very careful with my credit card usage! I make sure online I’m using secure check-outs. I don’t order anything when on my laptop and using unsecured wi-fi. So how did someone get my information? Well, the only thing I did different was call a florist last week, and give them all that information over the phone so I could order some flowers for a funeral. I’m thinking somewhere along the line, one of their employees grabbed the info, or someone went through their trash. . . whatever. I find it ironic that it’s likely a phone call messed me up. I rarely use the phone. I’m addicted to snail mail and email. I’m tired of things bugging me. How about some quiet days with nothing untoward happening for a while please??? I’m a little behind on just about everything these days. Okay, I’m a whole LOT behind. I’d like to say that’s unusual, but it seems to be the usual instead. I just seem to have more to do than I can keep up with, but no way to cut back on what I’m doing just yet. Plus we’ve been to West Virginia and back recently, and yesterday we just got back from a 4-hour trip to the Atlanta, Georgia, area so I could visit the Fibromyalgia & Chronic Fatigue Clinic near there. Mix in the fact we all have a summer cold that just won’t let go (the parrot has even taken to imitating us coughing, she’s heard it so much), andit’s just been crazy around here. 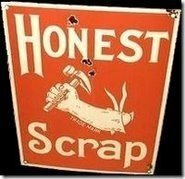 Anyway, moving on, I’d like to say THANKS to CeeCee at “My Little Bit Of Heaven” for giving me the Honest Scrap Award! Hmmmmm, something that most people don’t know. . . well, here goes! I used to like to cook. Now it’s just one more distraction, one more thing to have to worry about, while I’m trying to reach other goals. I got what must have been a spider bite over 4 weeks ago, and it still isn’t totally healed up. My grandfather wanted me to show horses, but I hated it. I loved working with horses, but I’m too introverted to enjoy being in front of people in a horse show. He finally declared I was “a better hand with horses than anyone he knew” but realized I wasn’t meant to be in the ring showing horses. My little sister took over that department. While I was in high school, I worked two summers as a “recreation aide” at a home for the ‘developmentally disabled’. One of my favorite occupations as a kid was going off by myself and hunting fossils. When I was a kid I fell onto our burn pile where there were some smoldering catalogs and ended up with 2nd and 3rd degree burns on the side of my right leg (long story how I managed that in the first place). For several years I made machine-knitted neck scarves, toboggans, and Cabbage Patch Doll clothes for Santa’s Workshop. Okay, that’s the first ten things I could think of. As for the other guidelines for the Honest Scrap Award – if anyone reading this would like to jump in and put an Honest Scrap on their blog, I’ll be happy to link to you if you let me know! Yeah, I know. It’s supposed to be “older AND wiser.” There’s just one problem with that. I’m older, but I don’t seem to be wiser. Nope, this whole wiser thing doesn’t seem to be working out for me. Maybe the rest of you are faring better. Granted, I wouldn’t do today some of the things I might have done in my teenage years, when a person thinks they’re invincible and going to live forever. But that still leaves a whole lot of questionable things that you’d think by now I’d know better, but somehow. . . I just don’t seem to. I mean, did you ever buy something you think is just going to be absolutely great and it turns out to be a real dud? It was advertised to do wonderful things that it just doesn’t come close to doing. Now after all these years you’d think I’d be totally immune to advertising hype, but no, sometimes it seems I’m no wiser. Or how about reading in your favorite magazine about the latest diet miracle? It’s GUARANTEED to make you lose 10 pounds in one week. I know better, I’m smarter than that, but… what if it’s true??? Or I try growing a certain kind of plant that really doesn’t do well in our climate, but I just know that this time it’s going to work… wrong again! Or here’s one of my downfalls… I open my mouth and tell things that I’d be better off keeping my mouth shut and not mentioning. I just don’t always think things through and consider what the ramifications might be. I get interested in a book or movie or something and stay up way later than I should. I know I need rest, but my brain won’t shut down. I know I should take my supplements, but I’m bad about forgetting them. I eat something I know I shouldn’t; it won’t make me sick this time. Wrong, wrong, wrong! So I do all these things that by now you’d figure I’d be smart enough to know NOT to do, or don’t do things that I SHOULD do. See, I’m older, but not wiser. Bummer. Yesterday I went out to do the morning chores wearing shorts and a tee shirt. Today when I went out to do chores, I wore jeans, a long-sleeved shirt and a light jacket. It is past the middle of October, so I guess I should expect this to happen. A cold front and a little rain moved in during the night, but I don’t think the rain amounted to much. I’m afraid this weekend won’t be as warm as last weekend either! Since it was up in the 80’s last Saturday, after all the hay was in the quonset hut, I decided it was time to give Toby a bath. I’d put some “spot-on” flea meds on him a few days previously, but he was still polluted with fleas, digging and scratching almost constantly. on the same color as my baggy shirt, so they kind of blend together, but they’re there! I used cold water from a hose (or hose pipe as one of my southern born & bred friends says), but Toby didn’t seem to mind. He loves to play in the water anyway, and seemed to enjoy being scrubbed all over. And at least now he’s not scratching at fleas! Well, maybe not quite all. But way back in April I promised to tell more about Ellie, and then more recently to tell about what I’ve been studying and working on lately. Some of it ties together, so here we go, Rural Writer tells all. What I’ve been studying: The main course I’m taking is on List Building and Internet Marketing. The Farmer can’t work forever, and since I’m handicapped by Regional Pain Syndrome and Fibromyalgia, I can’t work off the farm. I’ve toyed with many different ideas, but this seems to be the best fit. For the first few weeks we had up to 4 teleseminars a week, lasting a couple hours each. These were guest teachers, Internet Gurus sharing some of their wisdom on how they make money. We also had a weekly Q&A session with our two instructors, and we have online videos to watch and scads of stuff to do to implement what we’re learning. This is an INTENSIVE course. Now most of the people taking this course are flat out Internet Marketers. By that I mean they are learning about internet marketing, and they are going to sell internet marketing. Most, but not all! A few of us are learning how to build a list (you need someone to sell to) and how to market on the internet to different niches, such as art shows, home decorating, horse training, fitness, health food and more. My first niche is health food. One of the building blocks is a blog, and mine is “Health Food Made Easy.” I don’t believe it’s one way, all or nothing, but that you can make small changes to your diet to include more health food… one bite at a time. I’d love to have some new visitors and would really love some comments to liven it up. Getting started takes time, and I’d be thrilled for any support! While I’m learning internet marketing for my own “career”, I’ve got a second use for it as well. I want to apply some of what I learn to help raise money for Ellie’s surgery. More about Ellie: She’s my 3-year-old granddaughter. Ellie was diagnosed with Cerebral Palsy when she was a year old. She was born in Texas, but they moved to Canada to be closer to my wonderful DIL’s extended family, so they could have more help with Ellie. Also, Canada has a so-called “free” health care system. Most of the time that health care system is a good thing, and really helps with Ellie’s many medical and therapy expenses. The problem is the surgery she needs, a Selective Dorsal Rhizotomy, is best done at the St. Louis Children’s Hospital. They do a less invasive type of surgery, have done more of them than anyone else in the world, and have a better rate of success. Naturally, Canadian free health care doesn’t apply in the US. They’ve got to raise the money for Ellie’s surgery. A minimum of $40,000 worth of money. It needs to be done next spring for various reasons – Ellie’s age, and making it during better weather so it’s easier on her parents to drive an hour every day to take her to physical therapy after the surgery. My “building block blog” for fundraising is Helping Ellie Walk. 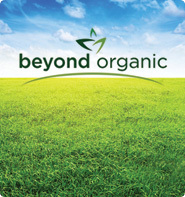 It’s just getting off the ground, and I have even more work to do with it than Health Food Made Easy. What is NOT easy is condensing all this information into one blog entry. What is NOT easy is trying to take classes and go through all the instructional materials, put what I learn into practice, keep up with the farm chores and household chores, and once in a while get some sleep. But I’ll try to do better at keeping updates posted here now and then, however brief they may be. In the meantime, you can always check out my other two blogs to see what’s happening with Ellie and one of my business ventures! And that’s my Reader’s Digest Condensed Version about Ellie and what I’ve been doing!